Try resetting a few times, as mentioned earlier. Works for me. Yea, it'll work if you reset a couple times, like Snake mentioned. 1207 worked for me without the alternate timing. Maybe that's got something to do with it? You mean without the crc hack fix, or the new fix? Well, 32X timing in Fusion seems to act different on different computers with different hardware setups... :\ I think the same is true for Gens IIRC. I open Kega in Hex Workshop and try to do a search for it but it won't allow me to paste it, or even type it manually once I get to where spaces are. Go to that offset (25B76) and overwrite whatever was there with that value (20). I hope it's okay that I kinda "bump" this but... if anyone is STILL having trouble, I edited my Kega today (which was one edited for the 1207 proto) with what Steve mentioned and I've had MUCH better results. It only crashes on me now if I try to play as Wechidna or ***** or whoever. Use that, again, you might have to reset a few times for it to show up but it should work just fine now. 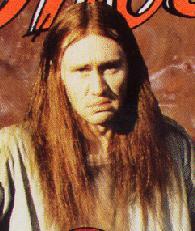 Not to get off topic but based on the picture of you on MobyGames, Steve, has anyone ever said you look sorta kinda like a combination of Nigel Planer as Neil Pye on The Young Ones and him as Ralph Filthy on Filthy, Rich, and Catflap? DON'T LET THE SUN LAUGH AT YOU. You guys realise that when the screen blanks to a colour it's certainly not in a crashed state, right? The game itself is still running fine; you can tell from the sound effects and other various signs that the game itself is still running for the most part. Err - no. I've been told I look like a lot of people. But never him. Truth is I don't look like any of them. I recon it's just the hair. Since the link at the top of the thread is down, I made an IPS patch of Fusion for people who can't hex edit. Included also is the wrapper .exe that was posted. Proper credit goes to the person who made it. I figured that could happen someday, so I added a download link on retro just in case. I recon it's just the hair.